Whether you are about to live with someone you recently met or with someone you have known for a long time, having a roommate rental agreement is considered as a smart and fair move. With the use of a roommate rental agreement, you can easily create and maintain peace and order between two or more co-inhabitants in a shared living space. Through such agreement templates, everyone will be aware of their responsibilities and all obligations will be clearly outlined. 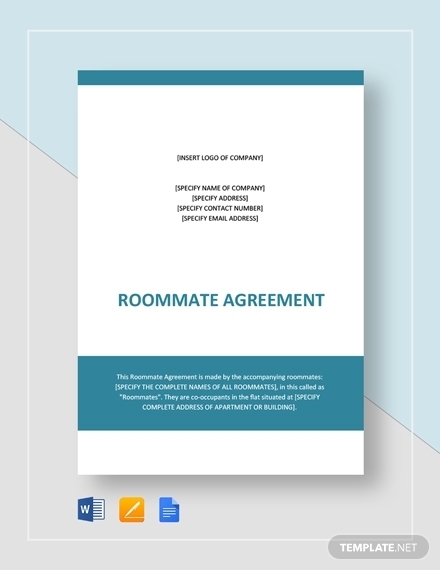 Be able to create respectable boundaries between you and your roommates with the use of the roommate rental agreement examples and templates provided in this article. 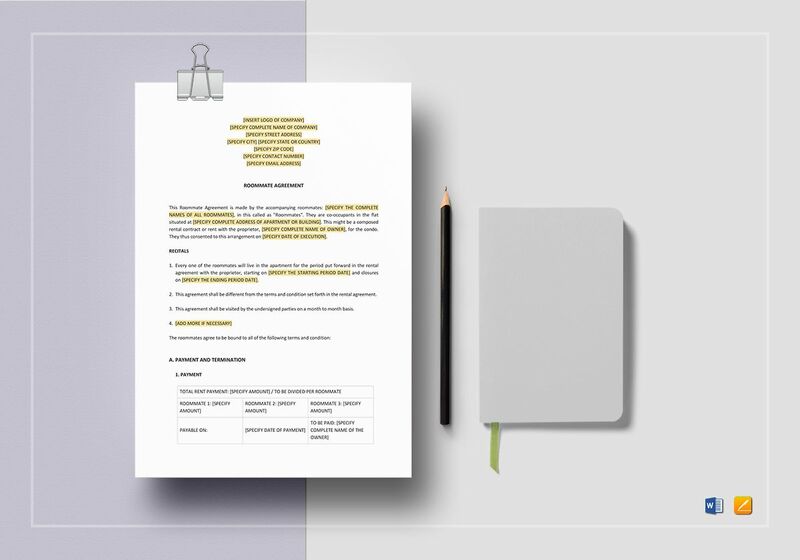 The following templates are in A4 in US letter sizes that are also customizable through the use of user-friendly software applications such as Microsoft Word and Apple Pages. 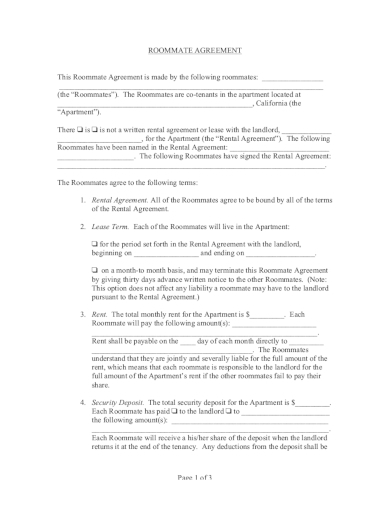 No matter who your roommate is, you still need to create a roommate rental agreement template. 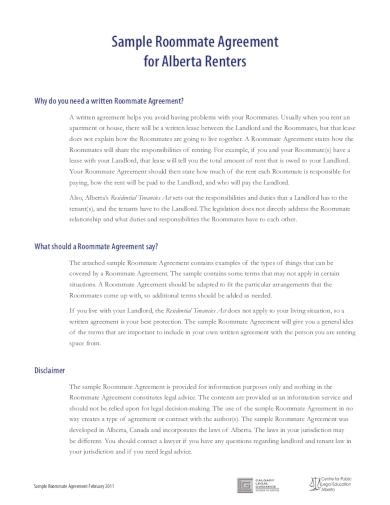 Having such kind of agreement maintains the harmony in your shared space and can even protect you financially in the event that one of you would skip out on paying the rent because a roommate agreement can actually be considered as a legal document. Who does not want to have a harmonious relationship with the people they are living with? But in order for you to achieve such a relationship, you must set clear rules and terms that will make your shared living space a pleasant one. 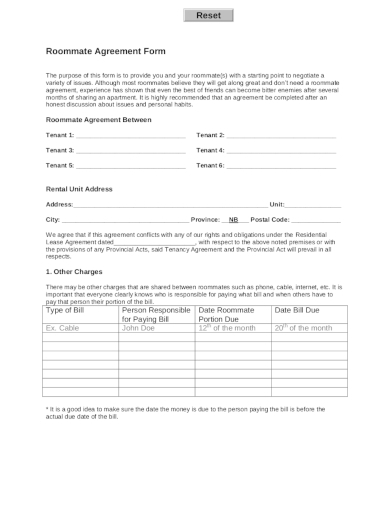 Lucky for you because we have already provided you with this roommate rental agreement form that is made especially for that purpose. Sure, the day you move in together with your friends can be considered as a momentous occasion. But what happens after that can be stressful especially if you already find yourself cleaning up someone’s mess and paying someone else’s dues. The only way to skip all the possible roommate drama is by making sure that both of you have set a roommate rental agreement right from the day you start living together. 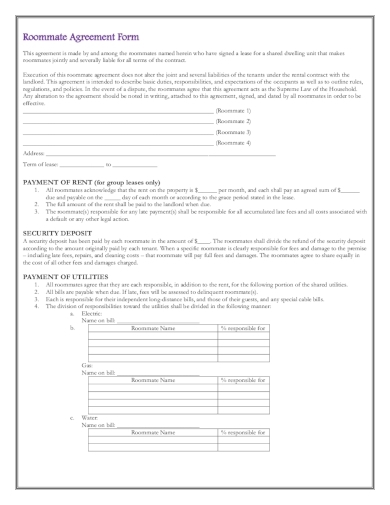 This basic roommate rental agreement contains all the basic elements that you must include in the roommate rental agreement that you are going to make soon. 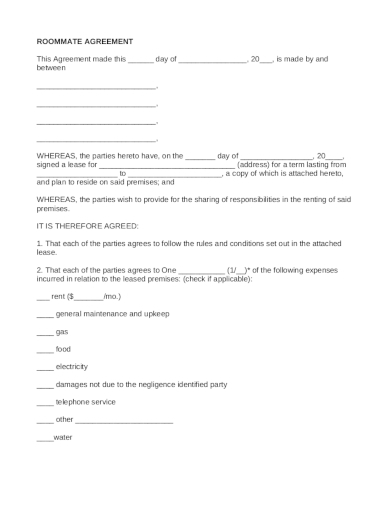 This example indicates that the names of individuals written on the agreement are liable to each other, particularly related to the rent payment, the bills, services, agreed upon additional charges, and any damages done to the any of the contents of the rented shared space. In college, you will most likely be living with roommates to cut down your rent costs. However, it is in college where you have no control whoever you are going to live with since most rental spaces would assign it themselves. And because of that, it’s either you are going to have a wonderful experience or a horrific one. To avoid the latter, it is best that you should create a college roommate agreement in order to achieve the former kind of experience. 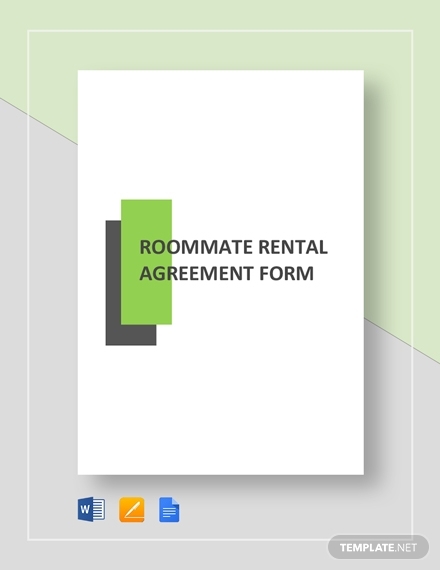 Save yourself and your roommates from any headache and drama by creating a roommate rental agreement. It is also encouraged that you will work on it together so everyone gets the right to say and write something on it. Aside from that, working and creating it together will help you in coming up with an agreement that is as comprehensive as the given example above. You may download the said example so you will be thoroughly guided on how to come up with one. What makes up a good roommate rental agreement is that it effectively details the rules that you and your roommate have set for yourselves. While there are many potential matters and issues that your agreement can tackle, the common ones you can include are regarding the rent and utility obligations, a plan for keeping your shared space spotless, how space will be shared, and even policies for matters like smoking and drinking. You don’t want to live with someone you constantly argue and disagree, right? This is why you must make sure that you will be able to prevent any possible disagreements by creating and signing a roommate agreement. Through this kind of agreement, you will help each other in clarifying each of your obligations as well as the house rules of your shared space. 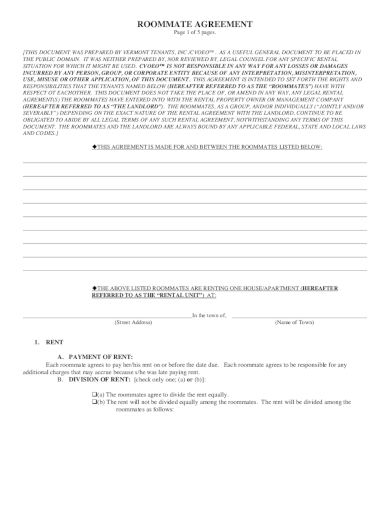 If you have no idea how to make one, you may get some important points of what a roommate agreement usually contains by downloading the given roommate agreement form example above. If you have already tried living with roommates before, you would already know that it can both be a fun-filled and a stressful experience all at the same time. It is possible that tensions between roommates are caused by each of your differences as an individual. However, if you will set a clear roommate rental agreement with your roommates, a positive living experience is assured. 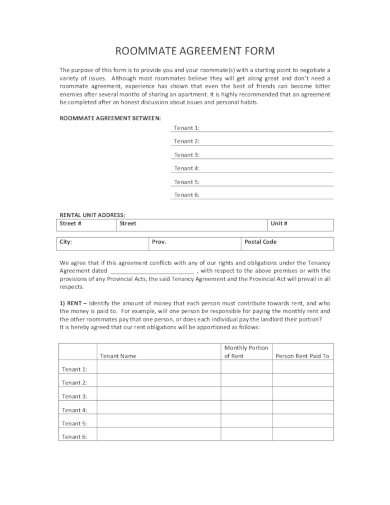 It is through drafting a roommate agreement that you will be able to put into writing all of the duties and obligations of each of student tenant in a shared rental property. It is also through such agreement that each roommate will have a clearer and better understanding of their monthly financial obligations such as the rent and utility bills and personal obligations of each tenant such as maintaining the cleanliness of the shared living space. You may also consider getting some key points of what this kind of agreement contains by downloading the provided example above.